The Cuisinart ASR-1713HPS Ovenware Nonstick Roasting Set is ideal for turkey dinners or large roasts, providing the perfect solution for everyday family meals, parties and holiday celebrations. The set has wide-grip handles for safe and easy lifting, which bodes well for transporting food from the kitchen to the table. 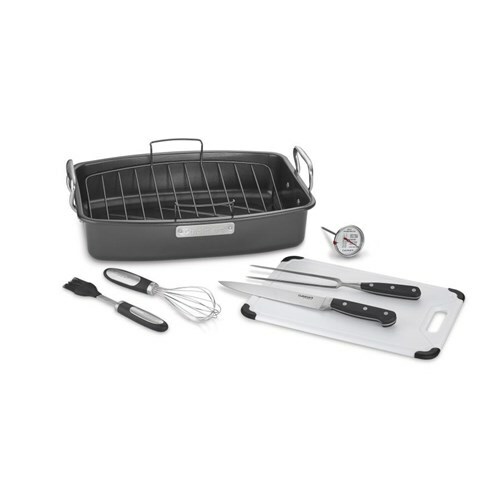 It includes a 17" x 13" roaster with rack; a carving knife and fork; whisk; silicone basting brush; meat thermometer; and a 13½" cutting board – everything consumers need to easily prepare a flavorful, generously sized roast. The Cuisinart 8-Pc Roasting Set has many exciting features for users of all types. 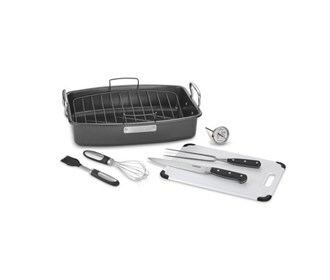 The Cuisinart 8-Pc Roasting Set is sold as a Brand New Unopened Item.